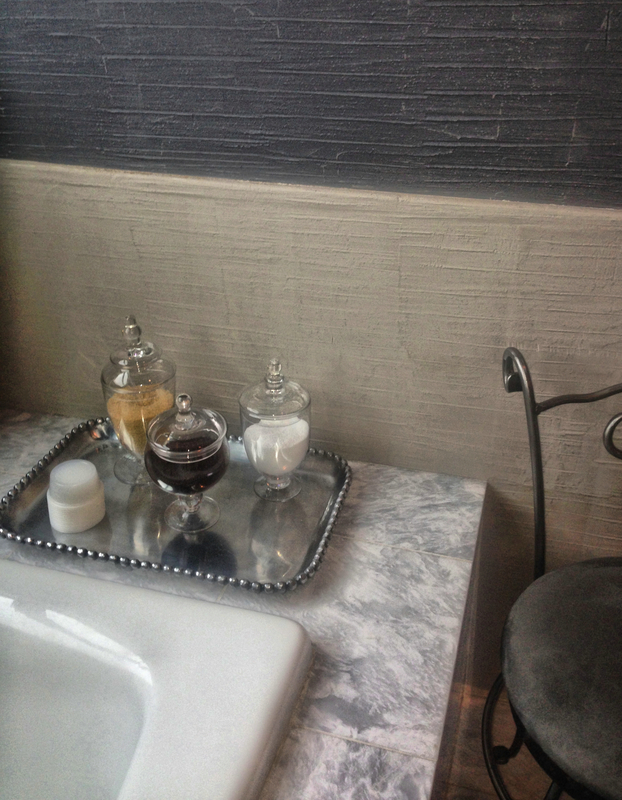 Body Treatments of your choice with the Apothecary Bar. Select herbs and essential oils to create either a scrub or an exfoliating wrap to produce a glow and relieve tension. I am a little shameless when it comes to stealing great spa ideas and repeating them at home. One of the cool luxury perks that was unique to the Ritz-Carlton in New Orléans, was a custom scrub in the shower area. I’m sure most of us have bought or been gifted a sugar or salt scrub at some time. Why not? They make excellent and affordable gifts. We can even make some pretty fancy ones at home. The genius in this lil perk was in its simplicity. The staff set out a tray near the showers. You could help yourself to a small cup, and fill it with your choice of a sugar or coffee. They provided a large bottle of body wash as well. The idea is to start with a bodywash you normally use, and add and exfoliant to it to help slough off dead skin and increase circulation. The pleasant scent takes your shower to the next level. Mini Apothecary Bar. 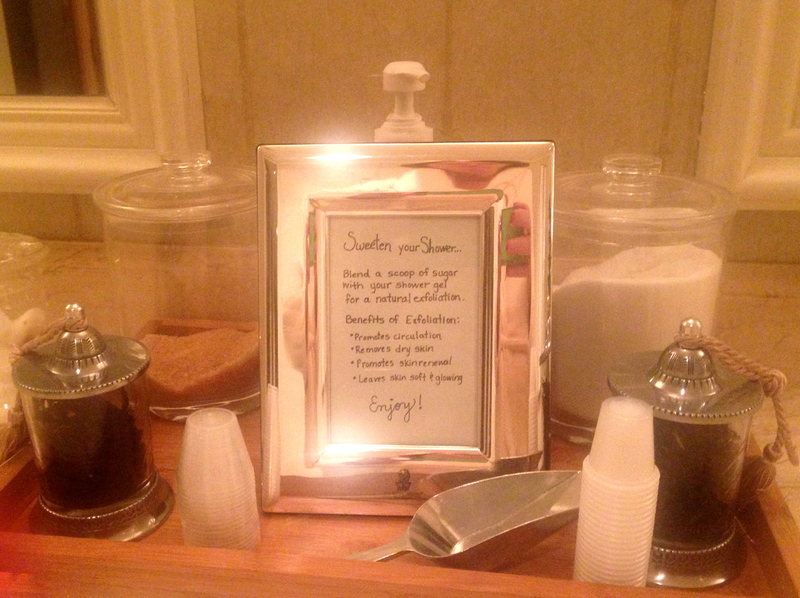 A sweet little perk for guests of The Ritz-Carlton Spa, New Orleans. An assortment of sugars and coffee to add to your shower gel. I happened to have a bunch of apothecary jars at home and not in use. 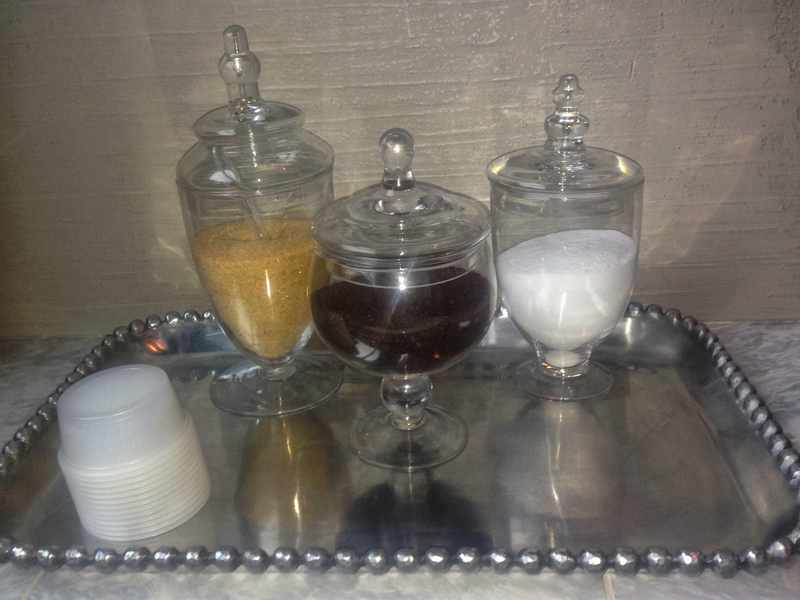 I filled the jars with turbinado sugar, kosher salt, and coffee. I then mixed one of those ingredients with some odds and ends bodywashes to clean out my bathroom closet. Canning jars or other bowls would look just as nice for a more traditional home or cabin. I included a spoon in the jar to make it easy to use and mix. I made this tray for use in my master bathroom. This tray would be a unexpected surprise in a guest bathroom as well. I used what I had on hand including sugar, salt, and coffee. 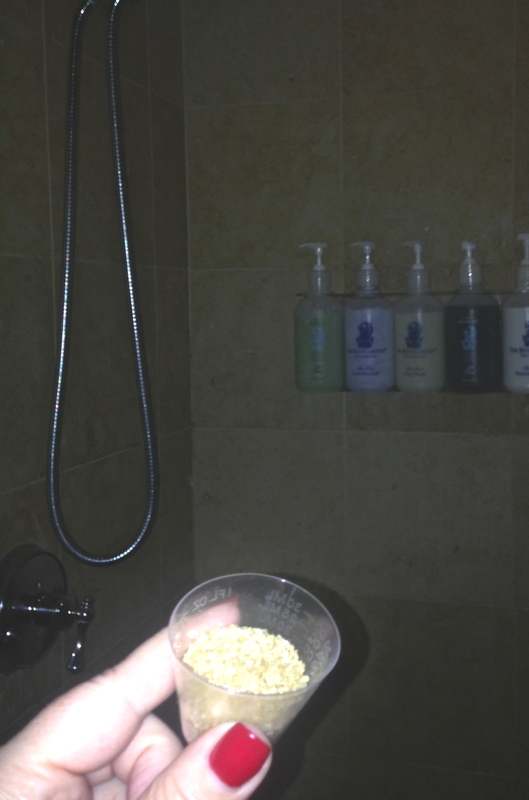 If you want to get super fancy, the Ritz-Carlton included more exotic ingredients for their body wraps. Dried flowers (lavender and roses petals), powdered algae, powdered honey, powdered clay, dried eucalyptus leaves, dried rosemary, sugars, salts, and essential oils. Set an intention to enjoy some quiet time and the process of self-care. Take care not to use any bodywash products that you do not have an experience with before adding an exfoliant. Try as a hand wash first, if you have any concerns about possible skin irritations. This scrub would be a nice first step in a home manicure, as well. If using an essential oil, be sure add just a few drops to a base or carrier oil. I like sesame, coconut, grape seed and almond oils for my base. If using oils, be sure to take care exiting the shower or tub. Raw Sugar used with the body wash, takes the shower up a notch. Let me know if you tried this and what your experience was! I learn by experience 🙂 I share because I care! even I fulfillment you get emtry to constantly quickly. I like to write early in the morning when it is quiet. Coffee also helps. No music or tv, and I have notes from my visit, which always helps get me started. Thank you.